Today the kids are heading back to school for Spring term… the sun is shining… trees are blooming in the garden… and my bracelet for today feels like the new season! 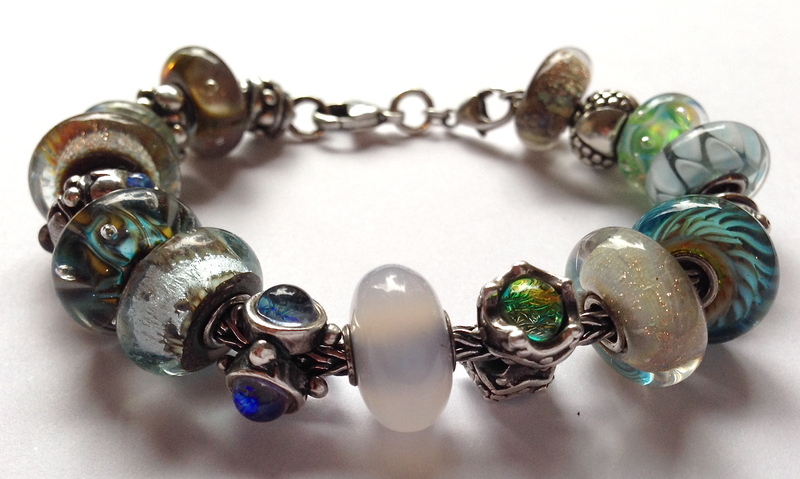 I just had to share this recent bracelet design, as I am enjoying wearing it so much. I adore the softest shades of blue, from periwinkle to aqua. 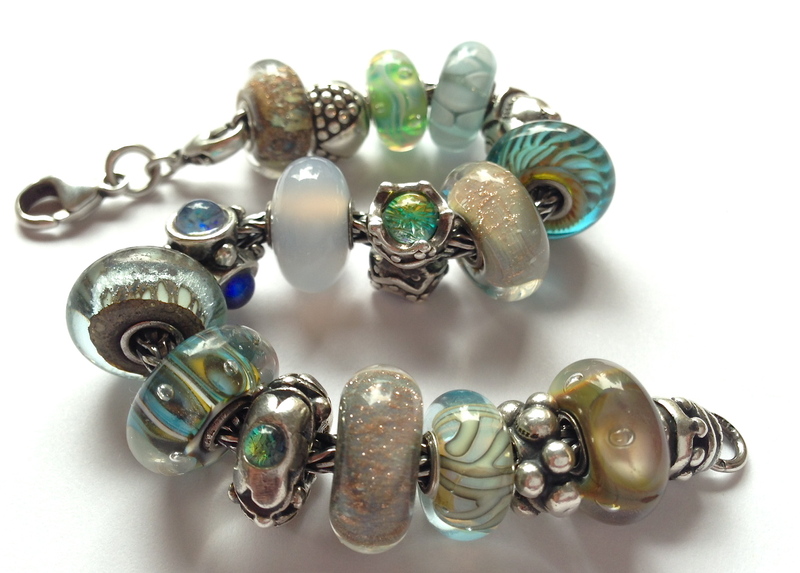 This bracelet incorporates my deeper teals, but really celebrates the lighter blues that give me such joy. 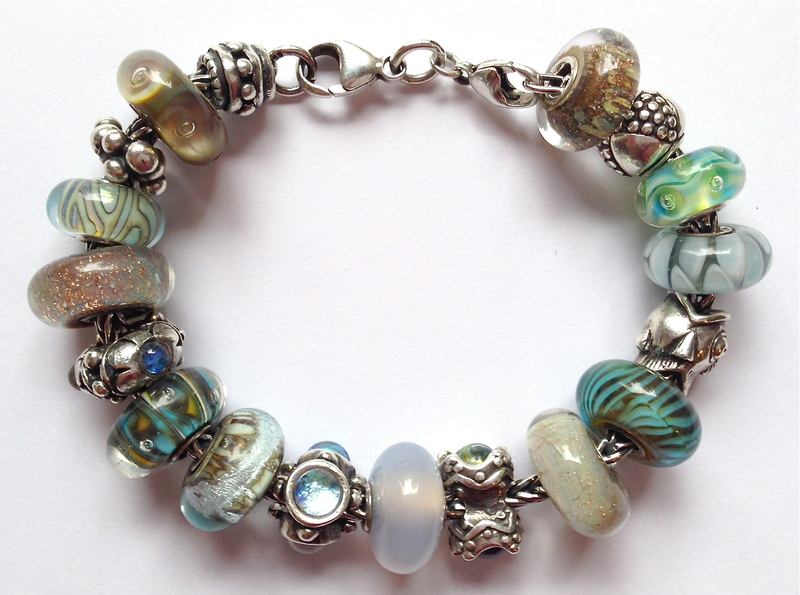 Many of the beads on this design are very humble, but old favorites nonetheless – a couple of “Blue Deserts”, a “Silver Mountain”, a “Light Blue Shadow”… and then there are a couple of the celebrated, tiny new uniques that helped to refresh the whole design! Clockwise from clasp: “Magical Lamp”, “Etruscan” (retired), “New Unique 2014”, “Light Blue Shadow” (retired), “Neither Fish Nor Bird, Large” (retired), “Blue-Green Feather” (retired), “Blue Desert”, “King & Queen” (retired), “Chalcedony” (retired form), “Trinity”, “Silver Mountain”, “Christmas in Australia Limited Edition”, “Carved Flowers” (retired), “Blue Desert”, “New Unique 2014”, “Cells” (retired), “Deep Bubbles” (retired), “Sandi” (retired). The brilliant, little, swirly bubble feels like a relative of the beloved “Azure Bubbles”, and my most recent addition is a very pale blue with what feels like mother of pearl patterning. (Wonderful!) Many people ask about the bead that is at 5 o’ clock on the bracelet above… a celadon green bead with gold sparkle, it’s a very odd “Blue Desert” that I was delighted to discover. However, in my opinion it’s the retired Chalcedony that steals the show… I love how it glows between the two dichroic glass beads. What are your Trollbeads today?